Melville, NY (October 6, 2016) – Nikon Sport Optics has officially announced the release of a revolutionary new product – the world’s first laser rangefinder to compensate for the human body’s physical inability to be completely still: the MONARCH 7i VR Laser Rangefinder. Featuring Nikon’s optical VR (Vibration Reduction) Technology, the MONARCH 7i VR is the world’s first* laser rangefinder to integrate this type of system. The VR Technology reduces the effect of external vibrations caused by unnecessary hand movements while ranging distant objects. For hunters, this means the target mark on the rangefinder remains stable, even when the body of the rangefinder is being moved. Not only does this provide the user with a steady image, it also stabilizes the activated laser, allowing it to maintain greater alignment for enhanced measurement performance. 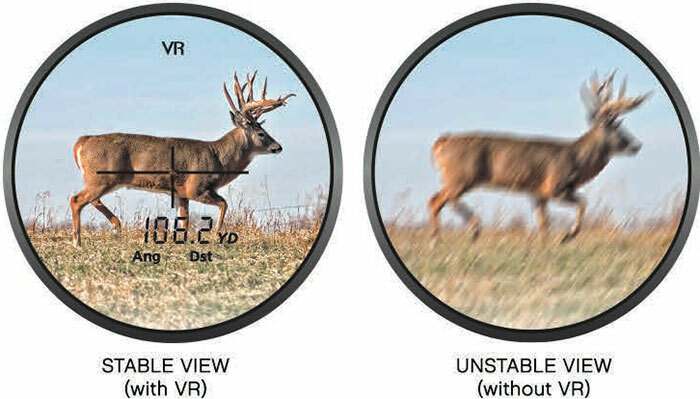 The MONARCH 7i VR represents a major step in hunting technology by helping alleviate the difficulty of keeping the rangefinder steady enough to range objects as far away as 1000 yards. This issue is partially due to the compact size of most laser rangefinders, which makes it challenging to brace it against a solid object, such as a tree or the edge of a deer stand. The rangefinder’s small size, combined with a strong wind, unbalanced position, physical exertion or just plain-old “buck fever” can make it virtually impossible to hold the target mark of the rangefinder on target and keep it still long enough to get a distance reading. Employing Nikon’s optical VR (Vibration Reduction) system, vibrations of the image in the 6-power viewfinder caused by hand movement are reduced**, while simultaneously aligning the viewed image with the irradiated beam for faster, more precise ranging. Because you can direct the laser onto the target faster and more easily, the ease of measurement to a small subject is greatly improved; all achieved by Nikon’s original technologies that are a fusion of VR technology and high-performance measurement function. The VR Function begins immediately when the laser rangefinder is on, meaning there is no extra time spent trying to toggle between settings. Holding down the ranging button allows the user to continuously scan for 8 seconds. A fast measurement is received (in approximately half a second), regardless of the distance, thanks to Nikon’s HYPER READ technology. The MONARCH 7i VR has an effective measurement range of 8-1000 yards and displays measurements in .1-yard increments. 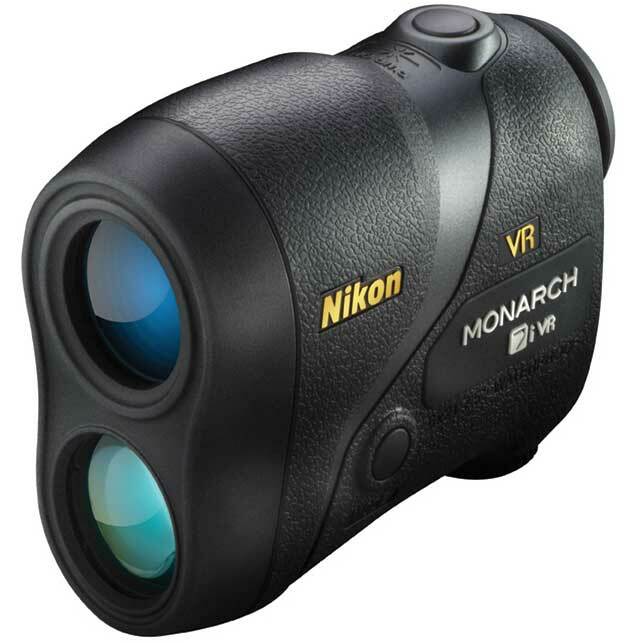 The MONARCH 7i VR Laser Rangefinder also boasts an uncluttered display and Nikon’s ID (Incline/Decline) Technology to compensate for uphill or downhill shooting angles by providing the one number that is needed to make the shot – the horizontal distance. 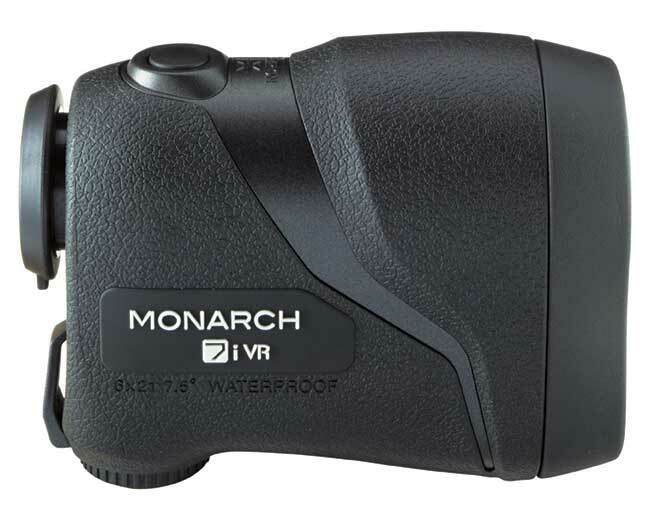 Another feature of the MONARCH 7i VRLaser Rangefinder is the ability to switch between First Target Priority Mode (provides reading of the closest target among a group) or Distant Target Priority Mode (provides reading of the farthest target among a group). Whether your subject is in front of or behind a patch of brush, this setting can greatly improve your ability to get the most accurate reading depending on the situation. Not only does the MONARCH 7i VR come in a compact and lightweight body, it is also waterproof for those unexpected wet conditions (battery chamber is rainproof). The suggested retail price of the MONARCH 7i VR Laser Rangefinder is $399.95. ** The effect of Vibration Reduction: Vibrations of the image in the viewfinder caused by hand movement are reduced by approx. 80% (1/5 or less than without VR function).